SPX: Long-term trend - Down! The very-long-term cycles have taken over and if they make their lows when expected, the bear market which started in October 2007 should continue until 2012-2014. This would imply that much lower prices lie ahead. This will not be a straight-down decline, but a series of intermediate-term rallies and declines until we have reached the low point. SPX: Intermediate trend - The counter-trend rally which started on March 6 is not over after all and 956 will most likely be exceeded with a move to 962 and perhaps 1000. 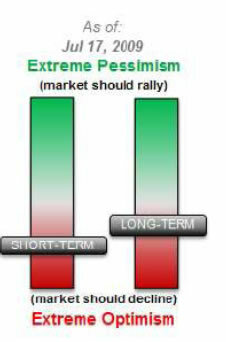 Daily market analysis of the short term trend is reserved for subscribers. If you would like to sign up for a FREE 4-week trial period of daily comments, please let me know at ajg@cybertrails.com . "Looking at all the statistics, the overall feeling is that the SPX has become overbought and is in a corrective phase rather than at an important top." On 7/8 The SPX made a low at 869.32, formed a small base for the next 3 days, and then started up. This past Thursday, it made a high of 943.56, and closed at 940.38 on Friday! And it looks as if it will not be satisfied until it has made a new recovery high. The NDX has already done it, and since one of my analytic tools is the NDX/SPX ratio, I feel comfortable with the premise that a new recovery high lies ahead. Under "Cycles", I had also written: "Long-term cycles should provide some buoyancy until the end of July or early August but they could be trumped by weak economic data." In fact, the Jobs report for June was worse than expected and sent the SPX down to its correction low; but then, excellent earnings by the large banks and some of the techs such as IBM and Intel had a reverse effect and were the trigger for renewed buying. The mood has quickly shifted from "The economy is showing no improvement after all" to claims that the recession is over, and this is the mood which is dominating the market right now. This kind of violent whipsaw action is confusing all except the best traders. This is the reason I have decided to drop EWT and stick to cycles and conventional analysis with an emphasis on the latter. We'll come back to it when it is an asset instead of a liability. Let's analyze the charts and see where we are. In the weekly chart, we can see that the SPX rally was first stopped by its secondary channel (brown lines) and the mid-point channel line of the primary channel (red). After a four-week decline which held at a previous support level, it is trying again to move higher, and has already succeeded in breaking out of the brown channel decisively, but it stopped at the red mid-channel line and has not yet made a new high. The top indicator never gave a sign of divergence at the top of the move -- how can you when you register 100%, which is as high as you can go? But it did give one during the correction, and this must be kept in mind if it is confirmed by a divergence on the upside in the current rally. The lower indicator never gave a sign of divergence, nor a confirmed sell signal either. Therefore this upmove, should not come as a total surprise. Since the top indicator is still overbought, and is now showing negative divergence, we must watch closely for the formation of a top, unless it is erased as the indicator moves up to 100% once again. The weekly chart gives us a good overall perspective of the market position and seems to be in sync with the longer-term cycles which want to give us a pull-back into the end of the month, and then push higher into early August. For a more detailed analysis, we'll move next to the daily chart. Because of space restriction, you can only see the top of the secondary channel (brown line) which was running almost parallel to the non-exponential 200-DMA. The SPX had broken above the MA on 6/1 but had failed to follow through because it was stopped by the top brown channel line. During the consolidation, it traded on both sides of the channel line and found support on the non-exponential 200-DMA. Since making its low on 7/8, the index has been in a powerful rally but Friday was the first day that it did not make a new high, and with the indicators curling over (something that we will see more clearly on the hourly chart) we may be ready to start forming a short-term top that will correct into the 20-wk cycle low near the end of the month. By overcoming 931.57, the SPX has re-established an uptrend and, after a correction into the cycle low, will be in a position to challenge its 956 high, providing the cycle does not bring too much weakness. A retracement to the support provided by the 50-day MA which is currently at about 914 would be ideal. I have drawn what I think may be the broader uptrend channel which is currently defining the uptrend. If the idea has merit, we should continue to explore the top of the broader channel until the longer cycles turn down in early August. Let's now look at the hourly chart (below). Two minor cycles bottoming on the 16th have probably given the last little push into higher territory before meeting with resistance at 943. There was a conservative point & figure count provided by the little shelf below to 941. This is about where we closed on Friday. One advantage of being late in publishing the newsletter is that we get to see the Globex action during the week-end. The September futures dipped as low as 928.30 before re-bounding to its current reading of 935.40, but it's anyone's guess what they will be tomorrow at the open. Note that there is a channel which defines the up-move from 869. With all three indicators rolling over after being overbought and showing some negative divergence, it is likely that the SPX is on its way to challenging the bottom of the channel, around 924. We'll discuss the potential dates for lows under cycles. I had almost given up on my longer-term cycles to provide a market high in early August, but it's looking pretty good for that time frame, now. Before we get there, however, Erik Hadik has us scheduled for a cycle low around the 23rd. There is also a 20-wk cycle due on the 28th-29th. There are now two potential projections for the high in the SPX: 962 and 1000. We'll have to decide which of the two will work best as we move forward. The NYSE Summation index (courtesy of StockCharts.com) which appears below, had become very overbought when the SPX hit 956. It has corrected along with the index without giving up too much ground. During the correction, the RSI became oversold and turned with the market. But negative divergence is already showing up -- something we were waiting on to determine that we were at an intermediate-term high. However, we are not there yet! After the RSI moves up to 60 or 70, it will be time to become concerned. The daily breadth indicator is beginning to roll over for a corrective move. It, too, is not yet indicating a top in the index. The hourly has already given a sell signal for a correction, in accordance with the cycles which lie ahead. The NDX made a new recovery high last week. Since it continues to lead the SPX, this constitutes positive divergence and suggests that there is higher to go before we make an intermediate term top. Only when it will begin to show some relative weakness to the SPX can we look for a top in the move which started at 667 on the SPX. The sentiment indicator (courtesy of Sentimentrader) shows the short-term indicator to be negative for the market, in accordance with the other indicators that are rolling over. This supports a pull-back in the indices over the next few days. The long-term indicator is just below neutral and gives us a little more room for the rally especially if we are going to be correcting over the short term. The indices have found new life indicating that the move from 667 is not yet complete. Our original time target of late July/early August should turn out to be correct after all. A price target of 662 or 1000 should be met. Market action will decide which is the right one.